Wash peas well before soaking (for two hours) and boil in the same water until cooked enough. (Do not use too much water if will also be added.) Soaking is not required if beans are freshly picked. When peas are nearly cooked, add milk from dry coconut, bringing liquid to about two or two and a half times the amount of rice to be used. See that pea grains are not broken. When peas are cooked, add seasoning. When cooked, stir with a fork before serving. NOTE: The amount and type of peas (dried gungo and green peas are also used when in season) vary from household to household. 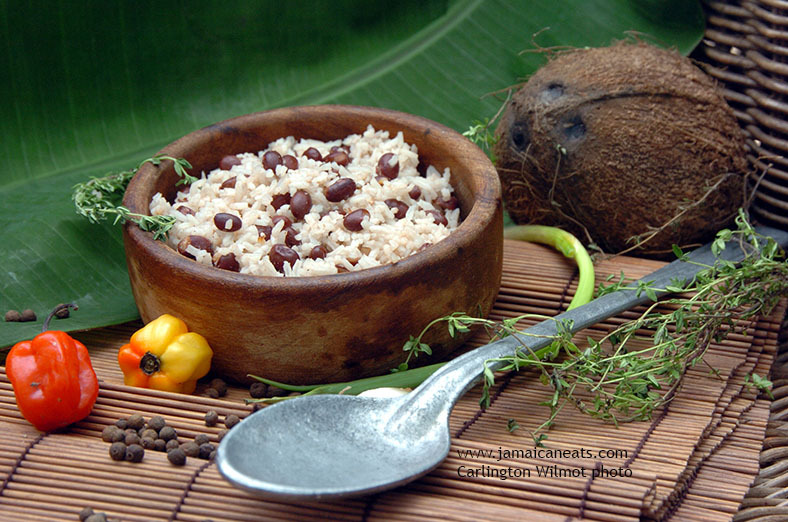 If using gungo or green peas, use double the amount of red peas called for in the recipe. Crack open the coconut and ease the white flesh from the shell. Grate the coconut flesh or cut into into cubes and puree in blender or food processor with water. Squeeze mixture through strainer to extract milk. The flavour and strength of the milk depends on the amount of water used. 5.Yields about 1/2 cup.